Change is Good…or is it? But there was one quote in particular that I never did seem to forget. It still sticks out in my mind to this day. And although the quote isn’t original at all to a Disney film, it is how it was ingrained into my mind. 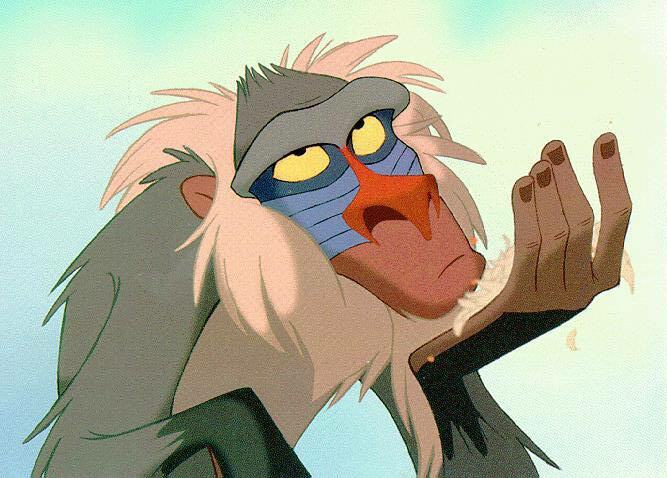 It was made by a baboon named Rafiki in the Lion King. He was speaking to Simba about how his life had turned out. Simba said that things were different than they used to be…that they had changed. And then he said it, in that deep West African dialect…“AHHH…CHANGE IS GOOD.” And of course whether you were a Lion King fan or not, you’re at least familiar with the phrase, especially if you were a Taco Bell fan in the late 90’s. But here’s the problem; even though we know the line, and although we may even want to believe it, it’s not really 100% true is it? I mean sure, sometimes a change of scenery or pace in life is nice, but for the most part, and for most people, change doesn’t feel good at all. It brings with it all kinds of emotions like uncertainty, fear, anxiety, a lack of confidence, and most importantly, it removes the comfort of routine and clear expectation. Even when it’s a good change, like a promotion, or a new relationship, or a new baby, or a move to a new location, those things come with a price. You have to say goodbye to the comforts of the old systems, and habits, and pace that you had become accustomed to, and relearn everything again. Plus you have to deal with all the stress that comes with it. It seems that while it may be true that the results of change can often be good, even great, the change itself almost never feels good, in fact, the opposite is true. For many, it can be terrifying. Take it from me. In the last few months alone, my wife and I have went through quite a few changes: changes in employment, changes in friendships, changes in family size, changes in schedules, all kinds of changes. And while the results of many of those changes are and will be incredibly good, going through the changes themselves are never easy. Some of you are right in the middle of a season of change as well. And you can agree with everything I’ve just written. And you may be asking questions like why…how…when? While those questions are ok to ask, honestly, they aren’t going to take away the anxiety that comes with change. No, there are much more important things to understand and do. So with that said, I’d like to take a moment and share with you a few encouraging things I’ve learned over the last couple of months with regard to change in your life, that will honestly be beneficial to you as you process through the change. So many times, when changes comes our way, we are tempted to resist it, particularly if it’s unexpected. We often want to prove why the change is not right for us, or that that the timing is off, or that it’s not necessary. We spend hours trying to convince ourselves, others, and even God why this change is not a good move. I see this over and over in young married couples who get pregnant long before it’s expected, right when careers are starting to take off. They are gripped with fear over the timing and and what it will mean for their future. But here’s a reality check: This may have been a surprise to you, but it wasn’t a surprise to God. As a matter of fact, he’s known about it for a long time. And since He just so happened to speak the world into existence, and continues to keep everything in the universe orbiting as it should, I think he has the power to handle the change in your life. Trust me, he’s in complete control. And scripture teaches us time and time again that he actually has YOUR BEST interest at heart. So rather than resist the change, worry about the change, fear the change…simply rest at peace in the change. EMBRACE the change, get excited about the change. If God wasn’t surprised by this, and He has big plans for your life, maybe it’s time you get on board and get excited about what He’s getting ready to do in your life. So when the shock wears off and the dust settles, don’t wallow, get up, get excited, & embrace HIS change for you. The truth of the matter is, we all have preferred times for things. People prefer to eat at different times, people prefer to schedule appointments at different times, we all have our preferences. I’m sure Abram & Sarai from the Old Testament would have preferred to have children at a much younger age than they did. But their preferred time wasn’t God’s appointed time. And YOUR PREFERRED TIME MAY NOT BE GOD’S APPOINTED TIME. You may have wanted to wait for this change to occur when it was convenient for you. But the truth is, God set an appointed time, and it was different from yours. So knowing that this was God’s appointed moment for you, not yours…SEIZE it. Don’t miss it. This is a God moment for you. It’s your chance to move in a divinely appointed time in your life. Don’t simply accept & embrace the change, but act in it. Don’t sit still. You didn’t do the changing, GOD did. And when God gives you an appointed moment, move in it. David was given a God appointed opportunity when he faced Goliath. He was just just a lowly shepherd boy, until God sent him a CHANGE in job description. It was unexpected, and potentially terrifying. He was still young, & I’m sure it wasn’t his or his families preferred time for the change, but it was God’s appointed time. So he moved, and acted in boldness seizing the moment God had appointed for Him, and as a result accomplished a GOD-SIZED miracle. Don’t miss your moment. See here’s the truth about change; it creates a FORCED DEPENDENCY. Often, when you have a comfortable routine in your life that you are used to, you can stroll through each day forgetting all about the God who has blessed you with the very life that you have. It gets easy to become self reliant, because YOU are the expert on the system. But when you get the rug pulled out from underneath you, and systems and routines in your life change, you are no longer the expert. In those moments, we find ourselves crying out to God asking for direction, and guidance, and comfort, and peace. We find ourselves doing the very things we should have been doing ALL along, but had no real need to. Change forces us into a posture of reliance and dependence on the only one who has control of our situation. It causes us to lean in relationally to the one who had been leaning into us all along. So while change may be difficult, and full of the unknown, it also creates an atmosphere for us to walk under the direction of God’s Spirit. Don’t let change pass you by, without it drawing you closer to the one you should have been that close too all along. Don’t miss the opportunity that He is giving you to live the way you were always meant to live, in close fellowship with His presence. And may it be a constant reminder when new routines form again. Just some things God’s been teaching me about change…I’m learning that change actually is good, even though it certainly doesn’t feel like it. But I’m learning it’s only good because of the good, well actually GREAT God who’s behind it. Have you ever had that lightbulb moment in the middle of an argument, or a disagreement, where you realize that you in fact are wrong? You know, when you’ve been working hard to prove your point, only to realize halfway through that you are the one that’s mistaken or incorrect. What do we do in that moment? Be honest… admit defeat? No, instead, what do we normally do? We storm off, we slam the door, we change the subject, ANYTHING but admit it. Why? Because intuitively, people HATE submission. We would rather run away from something or someone that has a one up on us than actually submit to it. We are by our very nature, runners! Think about it, when you were a kid, or a teenager, and your parents dropped that bomb on you; “not as long as you live under my roof,” What was your first thought? Submission to the protective authority of those God placed over you? OF COURSE NOT. You thought, “Well, screw this, I’m running away!” Some dingdongs actually tried it until they realized life costs money! Why? Again, because we would rather run than give in! Here’s the sad reality: So many people would rather turn their backs on the things of God, than fully surrender to the authority of God in their own lives. And here’s why: Because its always easier to run, than to surrender! But that doesn’t mean it’s better. The problem is, when you do this, you’re actually running from the only one which will never run away from you. See, when you submit to the authority of God in your life, you also place yourself under the protection of a loving father who will never leave you, no matter who you are or what you’ve done. I love my kids, and while it’s true that they are under my authority, that also means they are under my protection. And they know I would go to the end of the earth to take care of them. The same is true of our heavenly father. So when you’re weighing your options, don’t run…surrender.